Easy Origami Ghost Craft for Halloween! 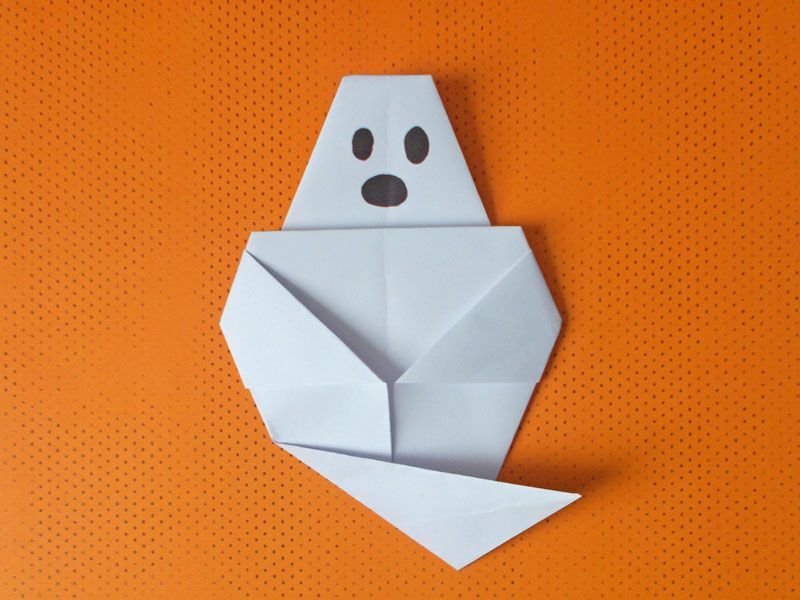 A ghost is the perfect origami Halloween decoration for young paper folders to make. You can make a simple paper ghost in just a few minutes, using very basic origami folds. Even children who have never done origami before should be able to make this model with a bit of adult assistance. To fold this easy origami ghost, you will need a square sheet of paper that is white on both sides. The larger the paper, the easier the project will be to fold. This tutorial uses a sheet of 8 1/2 inch x 11 inch paper cut into an 8 1/2 inch x 8 1/2 inch square. See our How to Make Square Origami Paper tutorial for an easy way to do this without measuring. If you're planning on folding the ghost as a group activity, it is best to have all of the paper cut before beginning. Young children have short attention spans, so you don't want to keep your eager folders waiting any more than what is absolutely necessary! You may also want to have models of each step of the project handy so the children can see what their ghost should look like as they are in the process of folding. Fold your paper in half along one of the diagonals to make a triangle shape. Unfold. Fold the left and right sides of the triangle in to the middle line as shown in the photo to the left. In origami, this form is known as a kite base. It is used to make many different types of paper folding projects, including an origami love bird. Fold the left and right corners back as shown in the photo to the left. Flip your paper over. Fold the flaps of the triangles you made in the last step so they lay flat against the sides of your ghost. When you're done, your origami ghost will look like the photo to the left. Fold the left and right corners of the paper in to the middle. When you're done, your origami ghost should look like the photo to the left. Fold the top triangle down slightly. Make an accordion fold where the ghost's neck would be. Flip your paper over once more. Fold the bottom point over as demonstrated in the photo to the left. Use a black marker to draw eyes and a mouth on your ghost. This cute little origami ghost has many Halloween uses. You can hang him in a window or tape a Popsicle stick to the back and have him star in a Halloween puppet show. If the ghost is made from a smaller square of paper, he can be added to Halloween treat bags, gift boxes, or party invitations. If you're looking for more fun origami Halloween decorations for kids to make, check out these 8 cool origami projects for Halloween!